Occasionally, we LOVE having toasted sandwiches as a meal. This is one of our absolute favorites! Pour the hot sauce and non-dairy milk into a shallow pie plate. Stir to combine. Place pieces of tempeh into the Buffalo sauce mixture, turning over to coat both sides. Set aside. On non-stick foil in the oven, roast the red bell pepper pieces and sliced onions at 400 degrees for 15 minutes. Set aside. Reduce the oven to 375 degrees. Place the Buffalo-marinated tempeh on baking sheet lined with parchment paper or non-stick foil and bake for about 20 minutes. While the tempeh is baking, mash the avocado and hummus together in a bowl. Season it, if you like. 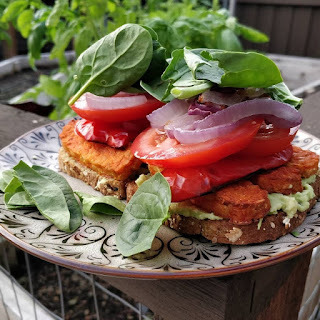 Spread avocado/hummus mixture on toast, add the baked Buffalo tempeh and veggies!